George Barris (born George Salapatas; November 20, 1925 – November 5, 2015) was an American designer and builder of many famous Hollywood custom cars, most notably the Munster Koach and 1966 Batmobile. George and his brother Sam (1924–1967) were born in Chicago in the 1920s. Barris was three years old when their father, a Greek immigrant from Chios, sent the brothers to live with an uncle and his wife in Roseville, California, following the death of their mother. By age 7, Barris was making models of cars employing balsa wood and modifying their design and appearance with careful attention to details so his entries won contests sponsored by hobby shops. The brothers worked at the Greek restaurant owned by their family, and were given a 1925 Buick for their help. Although it was not in good shape, they swiftly restored it to running condition, and began to experiment with changing its appearance. This became the first Barris Brothers custom car. They sold it at a profit to buy another project vehicle. Before George had graduated from high school, demand for their work was growing, and they had created a club for owners of custom vehicles, called the Kustoms Car Club. This was the first use of the spelling "kustom", which would become associated with Barris. Barris attended San Juan High School and "rushed to sweep floors at a local auto body shop as soon as school let out". Barris resisted his family's desire for him to work at its Greek restaurant in a Sacramento suburb. He moved to Los Angeles after turning 18 years old to "become part of the emerging teen car culture" and opened the "Barris Custom Shop" on Imperial Highway in Bell, California. Sam entered the Navy during World War II. Sam joined George in Los Angeles after being discharged. The two built their "kustom" designs for private buyers, and George also built and raced his own cars briefly. These activities brought them to the attention of the movie industry, and they were soon asked to create cars both for personal use by the studio executives and stars and as props for films, their first being used in 1958's High School Confidential. They also made the acquaintance of Robert E. Petersen, founder of Hot Rod and Motor Trend magazines and, much later, of the Petersen Auto Museum. His car shows further publicized the Barris style, as did the car customizing how-to articles George wrote and Petersen published. In 1951, Sam had customized a new Mercury coupe for himself, and a customer who saw it ordered a similar car. This vehicle, known as the Hirohata Merc for its owner, was shown at the 1952 General Motors Motorama auto show and was so popular it overshadowed the best work of Detroit's top designers. It also established the early 1950s Mercury as a popular basis for custom car design. In addition, Sam built Ala Kart, a 1929 Ford Model A roadster pickup. After taking two AMBR (America's Most Beautiful Roadster) wins in a row, the car made numerous film and television appearances, usually in the background of diner scenes. Sam decided to leave the business in the 1950s, but George had married and he credited his wife Shirley with major assistance in promoting the company, which eventually became Barris Kustom Industries. It began to license its designs to model car manufacturers such as Aurora, Revell, MPC, and AMT, which spread the Barris name into every hobby, department, and discount store in the United States and also into the minds of millions of eager model builders. In the early 1960s, Barris, along with other well-known customizers (Gene Winfield, Dean Jeffries and the Alexander Brothers) reworked production cars for Ford's "Custom Car Caravan" and "Lincoln/Mercury's Caravan of Stars". The traveling exhibits were designed to appeal to younger car buyers, both current and future. Barris also used the body of Pulsator (designed by Nye Frank) on his snowmobile dragster show car Ice Kutter. Barris is the subject of the title story in writer Tom Wolfe's first collection of essays The Kandy-Kolored Tangerine-Flake Streamline Baby. 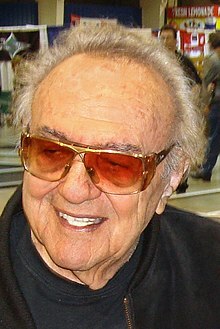 According to Barris, some of his first film work consisted of making soft aluminum fenders for a Ford police car that crashes into the rear of a Mercedes Benz convertible driven by Cary Grant's character in North by Northwest. The idea was to give the collision a comedic quality while also preventing serious damage to the expensive Mercedes. He also built and supplied cars for the 1958 film High School Confidential and loaned some of his customs for the "future" scenes in the 1960 film adaptation of H. G. Wells' The Time Machine. Other Barris-built film cars included a modified Dodge Charger for Thunder Alley, a Plymouth Barracuda for Fireball 500, the futuristic Supervan for a film of the same name, a gadget-filled Mercury station wagon for The Silencers, and a sinister rework of a Lincoln Continental Mark III for The Car. In the 1960s, the Barris firm became heavily involved in vehicle design for television production. At the beginning of the decade, Barris, who loved extravagant design, had purchased the Lincoln Futura, a concept car of the mid-1950s which had been built by Ghia of Italy. It remained in his collection for several years, until he was rather unexpectedly asked by ABC Television to create a signature vehicle for their Batman television series. Time was very short, as filming would begin in a few weeks, leaving insufficient time for a new design from scratch. Instead, Barris decided the Futura was a perfect base on which to create the Batmobile. Barris hired custom builder Gene Cushenberry to modify the car, which was ready in three weeks. The show was a hit, and the car gained notoriety for Barris. He retained ownership of the Batmobile until an auction on January 19, 2013, when Barris sold it for $4,620,000. This same car went on sale on JamesEdition in July 2016 and includes a batcycle as well. Other television cars built by Barris Kustom Industries include the Munster Koach and casket turned dragster (the "Drag-U-La") for The Munsters, an Oldsmobile Toronado turned into a roadster used in the first season of Mannix, a 1921 Oldsmobile touring car turned into a truck for The Beverly Hillbillies, the fictional "1928 Porter" for the NBC comedy My Mother the Car, Updated KITTs for later seasons of Knight Rider and replicas of 1914 Stutz Bearcats for Bearcats!. George Barris was responsible for the frame of the original Batmobile and other famous customized automobiles he created for various celebrities. Barris created a customized gold Rolls Royce for actress Zsa Zsa Gabor. The golden Rolls-Royce displayed the detailed work of Barris and included hand-etched window glass by Robb Rich showing butterflies, roses, and hummingbirds. Barris built many novelty vehicles for other celebrities; these include golf carts for Bob Hope, Bing Crosby, Ann-Margret, Glen Campbell, and Elton John; and 25 modified Mini Mokes for a record company contest involving the Beach Boys. He would also modify cars for Hollywood stars and others. Some examples include a Cadillac limousine for Elvis Presley, custom Pontiac station wagons for John Wayne, a Cadillac Eldorado turned into a station wagon for Dean Martin. and a pair of "his & hers" 1966 Ford Mustang convertibles for Sonny and Cher. With the cooperation of American Motors, in 1969 he modified an AMX coupe into the AMX-400 show car which was later used in a 1972 episode of Banacek. In the 1990s NASA contacted Barris to discuss an original Moonscope vehicle he designed back in 1966 which became a successful plastic car model for collectors. It's 6 wheel spider suspension and large wedged tires caught the attention of engineers preparing for the Martian rovers and eventual human Mars vehicles. Edward Lozzi, former White House Press Advance Office staffer and spokesperson for George Barris, who would later become a media consultant to Apollo Astronaut Buzz Aldrin, negotiated the request with NASA and stated, " NASA contacted my office and requested the original designs of the Moonscope from Barris. They revealed they were interested in studying the Barris designs for the Martian vehicles. Barris gave them permission and NASA sent people to meet with him". Between 2002 and 2006, Barris also designed two custom Cadillac hearses for episodes of the cable television series Monster Garage. Barris' company often builds replicas of non-Barris designed vehicles from other TV series, including The Monkees (Monkeemobile), Starsky & Hutch (Ford Torino), Power Rangers (Turbo Vehicles) and Knight Rider (KITT). Barris also designed and built the "Wagon Queen Family Truckster", based on a 1979 Ford Country Squire station wagon, for the 1983 film National Lampoon's Vacation. In 2005 The New York Times had Barris customize a Toyota Prius, one of the most popular cars in the U.S. yet according to the Times, one of the most unattractive. The budget was $10,000, and a further condition was not to chop the body or interfere with the hybrid mechanics in any way. In April 2010, the special George Barris design edition of the 2010 Chevrolet Camaro Spirit was introduced to the public for the first time at a VIP media event at Community Chevrolet, one of the largest Chevrolet dealerships in the United States. On November 29, 2012, Barris Kustom and George Barris announced the sale of the Number 1 Batmobile at the Barrett-Jackson car show and auction held in Scottsdale, Arizona. The world famous vehicle went on the auction block, on January 19, 2013. The final sale price, after a very intense bidding war, was $4.6 million to car collector Rick Champagne from Arizona. Over a decade after the release of Back to the Future Part III, one of the DeLorean time machines stunt cars used in the film was sent to Barris for restoration purposes to be put on display at the Petersen Auto Museum in Los Angeles. The car was returned to Universal Studios in 2003. Barris later purchased a stock DeLorean and converted it into a replica of the Back to the Future DeLorean, which he used to promote himself and his company. While Barris never officially stated that he had anything to do with the Back to the Future films, he did like to indulge in stating that he had built a Back to the Future DeLorean, but never disclosed that it was a replica car. In 2007, Universal Studios officials sent Barris a cease and desist order demanding that he never again make misrepresentations regarding any involvement with the Back to the Future films. They called upon Barris to remove images of the flying DeLorean from his company's website and restrict his display of replicas of the gull-wing car used by Michael J. Fox in the popular 1985 movie and its sequels. Back to the Future writer/producer Bob Gale went on record stating that "George Barris had absolutely nothing to do with the design or construction of the DeLorean time travel vehicle.” The DeLorean was designed on paper by Ron Cobb and Andrew Probert, and it was built under the supervision of special effects supervisor Kevin Pike and construction coordinator Michael Scheffe." Barris was married to Shirley Nahas from 1958 until her death in 2001. They had two children. He died on November 5, 2015, in his sleep at his home in Encino, California, fifteen days away from his 90th birthday. ^ Barris, George; Fetherston, David (2002). The Big Book of Barris. MBI Publishers. pp. 9–10. ISBN 9780760312469. Retrieved April 20, 2015. ^ a b c d Hennigan, W.J. (October 30, 2012). "George Barris' custom cars are legend in hot rod industry". Los Angeles Times. Retrieved April 20, 2015. ^ "sidebar". Hot Rod: 29. December 1986. ^ Barris, George; Fetherston, David (2002). "Chapter 2". Barris Kustoms of the 1960s. MBI Publishing. ISBN 978-0-7603-0955-1. ^ Taylor, Thom. "Pulsator Twin Engine Dragster", in "Beauty Beyond the Twilight Zone", p.36. ^ Barris, George; Scagnetti, Jack (1974). "Chapter 4". Cars of the Stars. Jonathan David Publishers. ISBN 9780760332221. ^ Thevenot, Brian (January 19, 2013). "Batmobile sells for $4.62 million at classic car auction in Arizona". Los Angeles Times. Retrieved April 20, 2015. ^ "1966 Batmobile, Price on Request at Jamesedition.com". JamesEdition. July 12, 2016. Retrieved July 12, 2016. ^ a b Featherston, David (1996). Barris TV & Movie Cars. MBI Publishing. ISBN 978-0-7603-0198-2. ^ Krause, William (2001). Hollywood TV and Movie Cars. MBI Publishing. ISBN 978-0-7603-0755-7. ^ Boyle, John (January 24, 2002). George Barris-Built TV Car Restored. Old Cars Weekly. ^ "Automotive crystal". R.J. Rich Cut Glass. Retrieved April 20, 2015. ^ "Kustom Galerry: From "Banacek" AMX 400". Barris Kustom Industries. 2004. Retrieved April 20, 2015. ^ Auto Editors of Consumer Guide (September 23, 2007). "AMX-400: Profile of a Custom Car". howstuffworks com. Retrieved April 20, 2015. ^ Leydon, Joe (March 26, 1997). "Review: 'Turbo: A Power Rangers Movie'". Variety. ISSN 0042-2738. ^ Tilin, Andrew (September 25, 2005). "Pimp My Prius". The New York Times. Retrieved April 20, 2015. ^ "The #1 Barris Kustom 2010 Chevrolet Camaro 'Spirit' Premieres in the USA in Burbank, California". Theautochannel.com. April 7, 2010. Retrieved February 13, 2013. ^ Coxworth, Ben (December 4, 2012). "Original Batmobile to go under the hammer". Gizmag. Retrieved April 20, 2015. ^ "George Barris to Auction 1966 Batmobile Number 1". Barriskustomnews.com. November 29, 2012. Archived from the original on April 27, 2015. Retrieved April 20, 2015. ^ Couch, Aaron; Lewis, Andy. "First Batmobile Fetches $4.6 Million at Auction". Hollywood Reporter. Retrieved April 20, 2015. ^ "Back to the Future DeLorean's Where are they now?". BTTF3 DeLorean. ^ Pool, Bob (May 4, 2007). "Star cars set off alarms". Los Angeles Times. ^ Grimes, William (November 5, 2015). "George Barris, Car Artist, Dies at 89". The New York Times. p. B17. Wikimedia Commons has media related to George Barris. This page was last edited on 17 March 2019, at 04:37 (UTC).